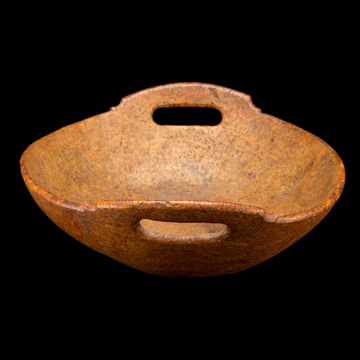 Though carved nearly two hundred years ago, the lyrical line treatment of this important bowl is surprisingly modern. Symmetrically composed, the basin is wide and shallow with elegant castellated sides depicting a Manitou—the head and tail reduced to the same form. It is arguably the finest regional example extant. Water serpents, monsters and panthers were widespread myths throughout the Woodlands cultures. They were both feared and revered and were thought to be found in rivers, lakes and streams. They are often illustrated with horns, serrated backs, long tails and short legs, however in sculpture the features are often minimized and reduced to semi-abstacted elements.